Rochester, N.Y. - An officer struggling to subdue a woman at the scene of a family dispute acted properly when he hit her in the head and wrestled her to the ground, despite her repeatedly telling officers she was pregnant, the police chief said. The chaotic Tuesday evening arrest of 21-year-old Brenda Hardaway and her 16-year-old brother was videotaped and posted on YouTube. WHAM-TV identified the person who took the video as the son of Hardaway's neighbor. The first 45 seconds of the five-minute video show Officer Lucas Krull pinning Hardaway face-down on the hood of a car while trying to cuff her hands behind her back. She resists, repeatedly telling him and other officers that she's pregnant. Krull then punches Hardaway in the back of the head and tosses her to the ground before other officers help him cuff her and others take her brother into custody. 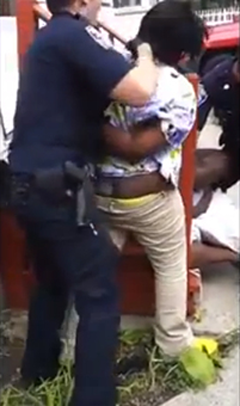 Rochester Police Chief James Sheppard told local media outlets that the officers showed "tremendous restraint" while subduing the teen and Hardaway, whose family said she's six months pregnant. Krull used a distraction technique that officers are taught to employ to disorient someone who's resisting arrest, Sheppard said. "While the video may cause concern relative to the officer's tactics, I stress that it is important that the incident be viewed in its totality and to withhold judgment until all the facts are known, including those parts of the event that are not shown on the video," he said. Sheppard said Hardaway had pointed pepper spray at officers checking out a report of a fight involving several family members. That part of the encounter wasn't shown on the video, he said. Hardaway was taken to Rochester General Hospital, where she was treated and released. Krull was treated for injuries to his nose and elbow. Hardaway pleaded not guilty Wednesday to charges that included assault and resisting arrest. She was being held Thursday in Monroe County Jail on $7,500 bail. A message was left for her public defender. Her brother was released after being charged with disorderly conduct and resisting arrest. Sheppard said the officers' actions during the arrest were being reviewed, as are all uses of force by city police officers. The review will determine whether the officers complied with the department's training and policy, the chief said.